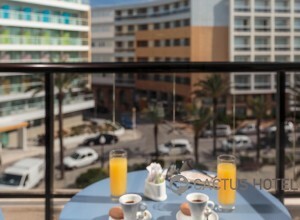 Featuring 172 rooms & suites, Cactus Hotel creates a sense of home and comfort. From classic sophistication to comfort and ease, these rooms and suites could not be more of a traveler’s delight. 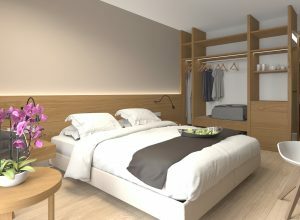 Sleek, cozy and intimate, they focus on providing all the comforts of home, to make your stay an unforgettable one. The standard Double Rooms successfully combine intrigue with comfort and hospitality, providing guests with a remarkable atmosphere of island living. 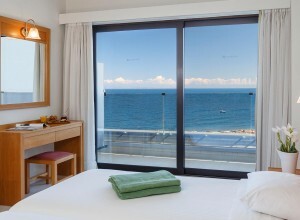 They are quite and comfortable offering stunning sea views. Guests can enjoy beautifully designed spaces, excellent facilities and thoughtful amenities. The Suites are situated on the top floors of the building, perfect for spending hours daydreaming away in blissful relaxation. Cactus Hotel mostly caters to an adult audience. Guests must be at least 25 years old to confirm guestroom accommodations, younger people are welcome accompanied by their parents. A valid photo ID must be presented at the time of check in for age verification.